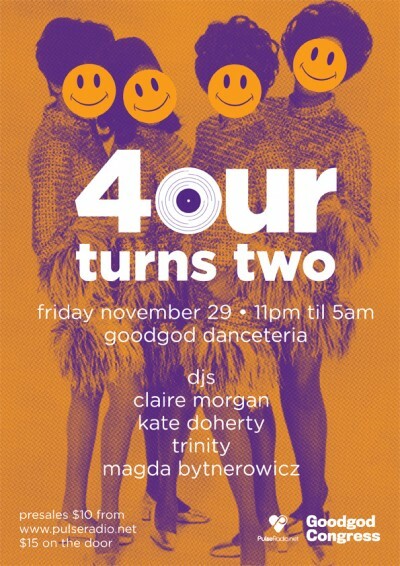 4our is one of Sydney most respected and much loved House and Techno nights and this Friday night they celebrate two years of cracking parties. To get you in the mood for their Birthday bash, resident Magda Bytnerowicz has provided us with a taste of some of the residents favourite jams that have been staples on the 4our dance floor over the past two years. Hold tight, stretch up and get hyped for Friday nights festivities with this list of tunes. From the album Black Business, this is one of Kate’s ultimate hip hop faves – vibes for days and a perfect warmup. Claire is the boss of badass, dusty and distorted Detroit monsters. This collab from Kyle Hall and Funkineven ticks all those boxes – hard. This is a massive summer time jam and has proven its worth as a floor filler for Kate over and over. Phwoar – we love Levon Vincent’s chops and this gorgeous piece from him is one his lesser known tunes, but no less impactful than the big uns. A brilliant example of the deep, driving, textured techno that Renae (aka Trinity) mixes so beautifully. Late night styles. This trippy tune by one of our past guests is one to make you imagine seeing things out of the corner of your eye at a certain time of the morning. A favourite of both Magda and Claire’s, this lush tune by one of the most masterful producers out there just works so well to create special moments at almost any time of day or night.